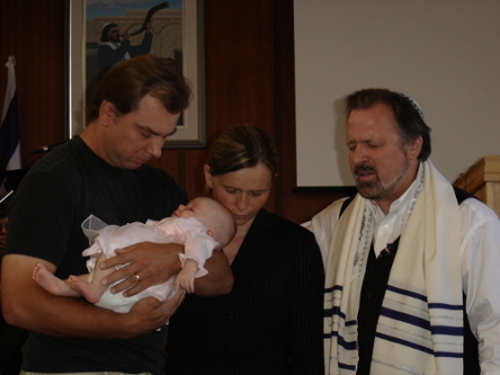 On August 8th, 2009, my daughter Maya was dedicated to God. I would like to take this opportunity to share something with you. Some of you may know that my family and I have attended a Messianic congregation for many reasons. One of the reasons is that their services are held on Saturdays and this is the only day which we are able to go as a family together to worship with other believers,( also very good worship and sound teaching from the Bible). I will share with you what has struck me the most, about their services. Jewish people have this incredible understanding of blessing. In the beginning of their service they bless each other and ask God to bless them. Before the reading of the word of God they ask all the children to come up front to be prayed over and receive a blessing from the rabbi and then the entire congregation. Then there is the reading of the Torah which itself is a blessing, and then there are many more blessings given throughout the service. At the end of the service an elder stands up and blesses the entire congregation for the week. It is such a contrast from many of our gentile churches and from our background in Poland. For example, fathers in most of the cases in Poland, instead of blessing, would curse their own families, saying things like "your dumb", "you won’t amount to anything", "it was a mistake to have you", "you’re worthless". It’s a shame because, not only are the parents cursing the future generation, but also they are bringing a curse upon themselves. We have to realize that there is power in the tongue to give live or death, to curse or to bless, and we are instructed in scripture to choose life and to bless. Remember, our children are the future of our countries and one day they will be able to either build upon our foundation or to destroy it. Also, one day they will take care of us, so it would be wise for us to bless them. Another example of how the Messianic church blesses the children differently is in how their dedication services operate. I have included, for you, a description sent to us by Rabbi Cal Goldberg of the service he performed for our newest edition Maya. We are dedicating Maya Grace today. She was born on May 28th. eleven weeks ago. The name Maya comes from the Hebrew word mayim which means water and the name Grace means Gods favor. 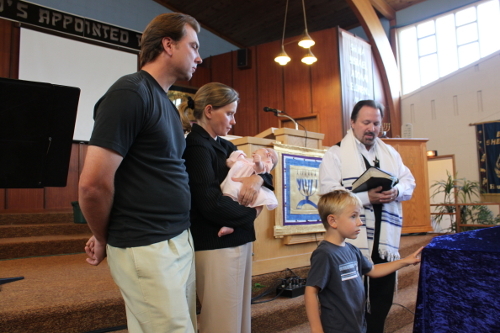 In a messianic community there is a strong emphasis on family and it is always a joy to dedicate a new born child in our Mishpachah. I consider it a privilege that Artur and Marjan asked me to dedicate their daughter to Adonai. As most of us know they are involved in the City Street Church and minister every week on the streets of our city. The main purpose of a child dedication is for the parents to recognize their responsibility to nurture and admonish their children in the way of righteousness and godly living. Psalm 127:3 proclaims that "Children are a heritage from the Lord, the fruit of the womb is a reward." As believers we are called to recognize that children belong first and foremost to God. God in His goodness gives children as gifts to parents. We not only have the awesome responsibility of caring for this gift, but also the wonderful privilege of enjoying God’s gift as well. Since children belong to Adonai and are given by grace as gifts to parents, it is only proper and appropriate that children be dedicated back to Him. We are told in 1 Samuel 1 that Hannah dedicated her son Samuel to the Lord. “I prayed for this child, and the Lord has granted me what I asked of him. So now I give him to the Lord. For his whole life he will be given over to the Lord"(1 Sam. 1:27-28). In Luke 2:22 we read that Miriam and Yoseph brought their son Yeshua to the temple in Jerusalem in order to dedicate Him before the Lord. In the same way it is Artur and Marzena Pawlowski’s desire to dedicate their daughter Maya Grace before the Lord by first presenting themselves and then their daughter to the Lord. The Shema which we proclaim every Shabbat reminds us as parents of our responsibility to be a godly example in our home. Deuteronomy 6:4-7.Ephesians 6:4 says: "Fathers, do not provoke your children to wrath; instead, bring them up in the training and instruction of the Lord." God’s instructions are clear. Artur and Marzena you are to love the Lord your God with all your heart, soul and strength and you are to teach Maya to do the same. As you love the Lord your God, with all your heart, soul and strength and your neighbor as yourself you will model before (MAYA) a wonderful example of God’s love that she will want for herself. Artur and Marzena I would ask now that you enter into the following commitment in the presence of God and his people (Marjana hand your daughter to your husband as a sign of his spiritual headship in the family). (Artur and Marzena ) In the sight of Adonai and in the company of these witnesses do you vow by God’s help to provide for (MAYA GRACE ) a Godly home of love and peace, to raise her in the truth in the Lord’s instruction and discipline, and encourage her to one day trust in Yeshua the Messiah as her Savior and Lord? Maya was born on May 28th. Her Parasha is from the book of Numbers – Ba Midbar which means in the wilderness. This book describes Israel’s experience of wandering in the wilderness. The lesson is clear. While it may be necessary at times to pass through wilderness experiences, one does not have to live there. For Israel an eleven day journey became a forty year agony. We can do it Gods way or our way. God’s way is to be obedient to His commandments and as are we will enter into the blessings of the kingdom. In Numbers 1:1-4:20 the names and description of the tribes are recorded. It also records how the Levites were chosen to be the priests instead of the firstborn to serve in the tabernacle. Numbers 3;11-13. It was the duty of Aaron and the sons of Korah to minister in the tabernacle and carry the glory of God the Ark of the Covenant. May Maya be one who walks in the glory of Adonai and that the light of the Messiah would shine through her as much as the Messiah shines through her parents. I also ask that our congregation make a vow as well. There’s an old proverb that says "it takes a village to raise a child." Parents have the first and greatest responsibility but parents need the help and support of a community. So I direct my question to our Mishpachah. That we will as a community will do our best to provide a safe place of worship, support and instruction as long as this child and her family continues to fellowship among us. That we will covenant together to set an example by our words and deeds to maintain an environment in our Mishpochah that will inspire children to seek after God. And that as God reminds us, we will pray for this family and for Maya Grace’s salvation. Those of you who are willing to accept this charge, please answer. With the words, With God’s help we so covenant. Maya Grace I anoint you with oil as a symbol of the Ruach Ha Kodesh under whose protection and guidance your are being sealed and protected. I dedicate you to the God of Abraham, Isaac and Jacob in the name of Yeshua Ha Mashiach our Messiah and Lord. And just as Maya Grace has entered the covenant through his parents, so may she one day enter into the Torah, the marriage canopy and a life of good deeds for the glory of God. V’simkha Elohim k’Sarah, Rivkah, Rakhel, V’Leah V’ Yeshua HaMashiach May God make you like Sarah, Rebecca, Rachel, Leah and Yeshua Ha Mashiach. Aaronic BenedictionYvarekah adonai viyish marekha. Yaer adonai panav elkaha vee khu nekha, Yeesa adonai panav elekha vayahsaym l’khah shalom..
May the Lord bless you and keep you, may the Lord make His face to shine upon you and be gracious unto you. The Lord lift up His countenance upon you and give you peace. 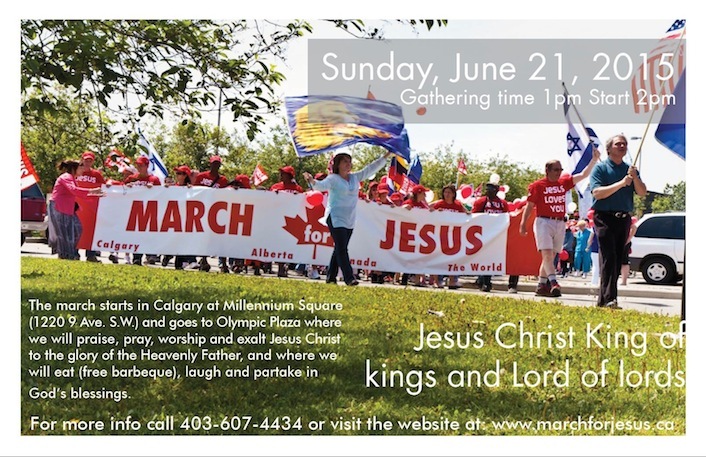 March for Jesus in Calgary! May 14, 2015 Artur Pawlowski Comments Off on March for Jesus in Calgary!